Sometimes we are asked why our vegetable CSA is cheaper than other farms. There is a very simple answer. Eggplant, squash and peppers. For the first 2 years of growing a vegetable CSA we never gave them out. Ok, in 2 years we gave out one winter squash. But no zucchini, little delicatta, no yellow squash, tiny amounts of pattypan. And not one eggplant. Not one pepper: hot, bell, bullnose, lipstick. Hubbard squash, pumpkins, acorn, blue squash, watermelon: zip. Tomatoes? We got 'em. From tiny to massive, in many colors and shapes. From early to late in the season. Tender skin, delicious in taste. 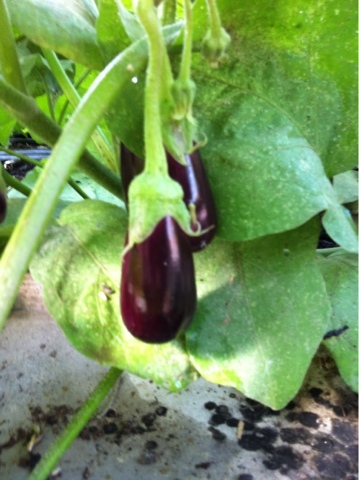 And this year we have eggplant. A few small peppers. Squash plants not yet consumed by squash bugs. These plants all take forever (at least it feels like it to us) to grow, forever to flower, get pollinated, set fruit, grow out to decent size. It seems that the summer phenom of being overrun with zucchini happens with the hybrids, or chemicals, or something we do not do.